Biopolymer Films Market size will surpass USD 6.7 billion by 2025; according to a new research report by Global Market Insights. The overall biopolymer films market size is majorly driven by increasing demand for eco-friendly packaging among consumers. This has urged plastic manufacturers and packaging vendors to shift their focus toward biopolymer packaging and implement strategies for its branding and customer acquisition in coming years. This shift towards organic packaging of premium food items, medicines, and other consumer goods will propel the overall biopolymer films market growth. 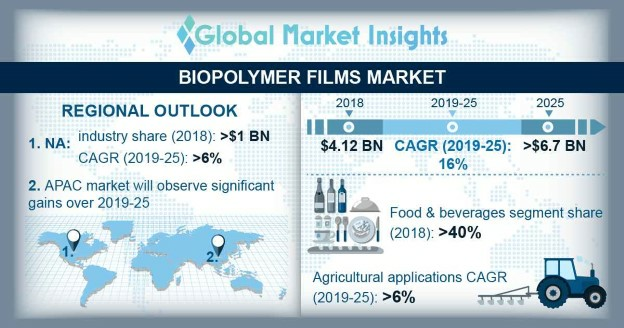 Furthermore, establishment of edible biopolymer films in the food market will complement the overall industry share over the estimated timeframe. Stringent regulations opposed to the use of synthetic or petrochemical-based films in food packaging on account of its adverse effects in case of direct food contact, will eventually favor product demand in food & beverage packaging industry. This is turn will positively influence the global biopolymer films market share over the estimated period. The product offers added benefits such as, biocompatibility, eco-friendly characteristics and easy raw material availability. Some of the crucial challenges of the global biopolymer films market is their relatively high cost of bioplastics materials as compared with Petro-plastics, as well as issues of quality/consistency and density might hamper the overall industry growth in the near future. Biopolymers films market share by multilayer technology held the maximum industry share in 2017. This technology facilitates product characteristics such as favorable in terms of CO2 emissions, moisture barrier, which makes the product more convenient across numerous end-use including cosmetics, food & beverage and pharmaceutical packaging. These films are highly preferred in packaging material for low or dry moisture content products. Based on volume, polylactic acid (PLA) segment will capture over 25% of the biopolymer films market share. The product is a bioactive and biodegradable aliphatic thermoplastic polyester that is obtained from renewable resources and inhibits compostable, biodegradable and thermoplastic properties. Increasing product applications in end-user industries including agriculture and food packaging is positively influence the global industry size over the projected timeframe. Food & beverage segment led the global biopolymer films market end-user base in 2017. Escalating packaged food demand, particularly due to increasing per capita income, along with growing number of working population across the globe will boost industry size. For instance, packaging products from biopolymers films are used in the packaging of fresh food, tetra packs, dry snacks, bakery goods, juice bottles, and meat trays along with coatings for beverage cups, films, and card stock. North America driven by the U.S. will exhibit growth with a CAGR of over 6%. The regional industry share was mainly attributed to prevalence of strict norms favoring bio-based products for food packaging applications and robust packaged food industry in the U.S. market. Moreover, huge R&D expenditure in U.S. will augment the market growth by 2025. In addition, Asia Pacific, mainly led by India and China, will be the fastest growing region during the coming years.